MONDAY, JUNE 19, 2017. 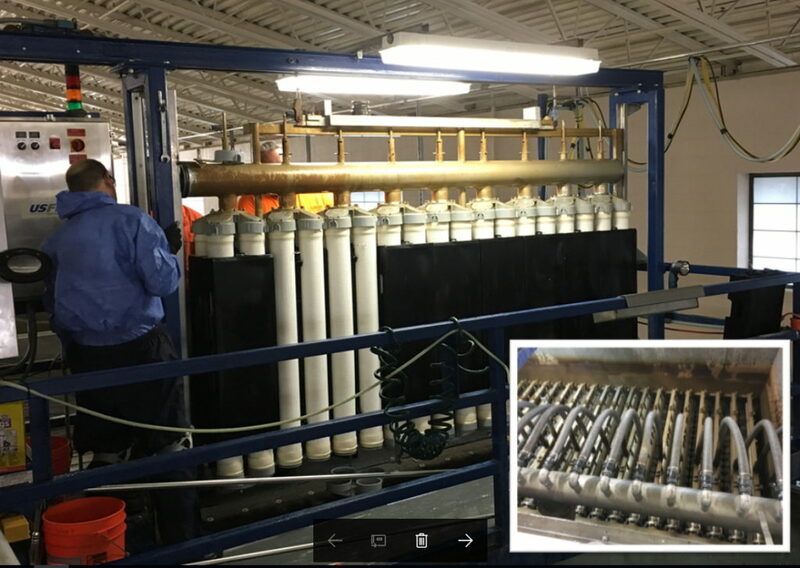 The City of Albany, Oregon contracted with Scinor Water America to replace 320 submerged NIPS PVDF modules supplied by the original system manufacturer with state-of-the-art Scinor Direct Retrofit TIPS PVDF modules. The Scinor SMT600-S26 modules, a plug-and-play replacement, were installed in April 2017 at the Albany-Millersburg Water Treatment Plant in Albany, Oregon. The 12 MGD plant was put in service in 2005 and treats water from the Santiam River. Pretreatment is accomplished using coagulant (ACH) prior to filtration. The City continuously evaluates membrane performance and identified half of the modules from one cell were quickly approaching the end of their service life. The planned life-cycle replacement would enable the plant to restore membrane performance, fiber integrity and operational consistency. A City review panel comprised of senior water department personnel conducted a thorough cost and quality comparison of replacement options and concluded that the Scinor alternative was preferable due to advantages in product filtration capacity, operating conditions, warranty, life cycle cost and customer service. In addition, the direct retrofit modules allow the City to qualify a replacement for a product which previously required sole source procurement. Scinor direct retrofit products are approved by the Oregon Health Authority (OHA), the State regulating body for potable water. Initial performance testing of the newly installed modules indicate that the cell was able to operate at design capacity (2-3x normal flow) with very low rate of fouling. Integrity testing verified that the new filters produce a very low pressure decay result indicating excellent fiber integrity. The TIPS UF membranes, which are utilized in Scinor’s entire product portfolio, are expected to provide the end user with greater permeability, strength, fouling resistance and service life. The direct retrofit of the originally supplied membranes emphasizes the strong demand for high-performing replacing filters and is currently being replicated by other end users experiencing similar operational issues.